Josh Bahen's chocolate tastes like twigs, and he's delighted. He's part of a new breed of craft chocolate makers who swear allegiance to the cacao bean and all its chewy, funky, fruity characteristics. Their mission: to make chocolate that speaks of where it was grown. To express its terroir. To do this, Bahen makes his chocolate in small batches - with beans bought directly from the cacao farmer - using only one other ingredient, sugar. Most chocolate makers rely on pre-prepared cacao mass as their starting point. Not on the bean. In setting up a modest factory among the grapevines on his parents' vineyard, Bantry Bay in Margaret River's Yallingup, Bahen, formerly a senior winemaker with Moss Wood Wines, has joined a small band of true believers - bean-to-bar chocolate makers. Like craft beer brewers, natural winemakers and bespoke coffee roasters, craft chocolate makers are driven by flavour. The fact that every batch will taste different, even when the beans come from the same grower, is celebrated. In Europe, grand chocolate houses, such as Bonnat Chocolatier in France and Chocolates Valor in Spain, have been making bean-to-bar chocolate for generations. Australia's own family-owned company, Haigh's Chocolates, has been making its chocolate from beans since the 1930s. The new bean-to-bar craft movement is making chocolate in a different style, Bahen says, ''and it's booming, especially on the west coast of the United States''. It began in the 1990s with some intrepid entrepreneurs, including California's John Scharffenberger and Robert Steinberg, of Scharffen Berger (now owned by Hershey's), and has been growing ever since. Combining cacao beans and sugar makes dark chocolate, which can range from 35 per cent to 99 per cent. The percentage indicates how much cacao is in it: for example, an 80 per cent dark chocolate will contain 80 per cent cacao and 20 per cent sugar. That's all. To be labelled chocolate in Australia, a 100-gram bar must contain 20 per cent cacao bean derivative (cacao bean mass and butter). The remaining 80 per cent will comprise milk powder, emulsifiers, and fats. Many bean-to-bar makers eschew milk chocolate - made with the addition of milk powder - but there are excellent examples to be found, among them Goddess Milk, a 52 per cent cacao milk chocolate, from Zokoko, a small chocolate maker in western Sydney. The higher the ratio of cacao bean to sugar, the more bitter the chocolate. For some, it's an acquired taste. For others, it's an epiphany. Like others before him, Bahen was intoxicated and set out to make the best chocolate he could. How could he know the trials and tribulations that lay ahead? The international chocolate industry operates on a large-scale industrial model that simply doesn't accommodate small-scale operators. To buy the types and quantities of beans required and find smaller chocolate-making machinery, the artisanal chocolate maker is forced to forge new paths. Since starting Zokoko in Sydney in 2009, Dean Morgan (also a coffee roaster) has travelled the world in pursuit of cacao beans. As a template for a craft chocolate factory, Roald Dahl's imaginary creation for Willy Wonka is not too far off the mark. Most are fitted with vintage machinery, much of it reconditioned, or machines that have been adapted from their intended use to undertake one of the many machine-dependent processes involved in making chocolate. First, the beans are cleaned and roasted. The bean shell is then cracked and removed using a winnower, resulting in cacao nibs. These are put into a melangeur, which mixes and grinds them into a paste called cacao mass (or liquid), consisting of beans and cacao butter. The next step, conching and tempering, refines the chocolate so it's smooth and pleasurable to eat. Conching agitates the liquid cacao mass to distribute the cacao butter evenly to produce cacao particles that are smaller than the tongue can detect, a process that can take up to 72 hours. Tempering involves heating and cooling the chocolate to encourage the formation of a particular crystal size, resulting in a chocolate with a lovely gloss finish and a firm snap. But adversity won't stand in the way of a man (or woman) possessed, and craft chocolate makers are a driven bunch. Just in the past two years, Bahen has noticed that machinery is becoming even harder to come by. One of the US's bar-to-bean pioneers, Steve DeVries, who started De Vries Chocolate in 2005, uses the tag line ''One hundred years behind the times'', a sentence that captures the magic of the movement well. It's small-scale, artisanal and made by hand. And it tastes great. 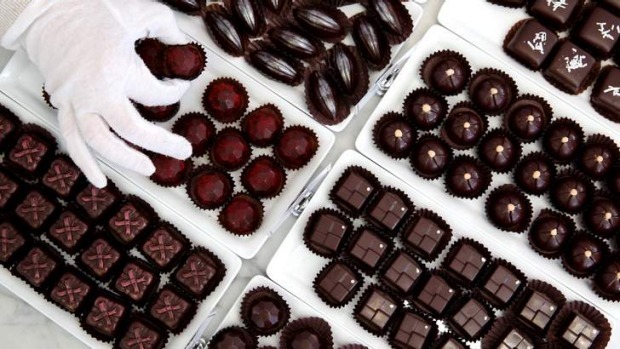 Every chocolate maker dreams of getting their hands on the perfect bean and, like 17th-century plant explorers, chocolate makers are in hot pursuit of heirloom cacao varieties around the world. There are three main varieties of the species Theobroma cacao: criollo, forastero and a hybrid of the two, trinitario. But recent international expeditions have yielded exciting finds. A 2008-09 US Department of Agriculture and Agricultural Research Service project in the Amazon identified three populations of cacao that had not been previously recognised. In Peru, they unearthed one of the rarest and most prized varieties of cacao, pure nacional, a member of the forastero family. Another project by the same agency mapped cacao genetics in Honduras and Nicaragua, revealing a high level of genetic diversity between cacao species. Once believed to be extinct, pure ancient criollo has been rediscovered by the Madecasse Chocolate Company in remote north-west Madagascar. The excitement about finding different heirloom varieties promises a Pandora's box of flavours to play with. Made on a vineyard at Yallingup in Margaret River, Western Australia, by former winemaker Josh Bahen and his wife Jacqui. Must try The citrus fruit-driven 70 per cent Madagascar. Made using heirloom beans from a farm established in the 1920s. bahenchocolate.com. Cacao beans grown in the Daintree in Far North Queensland go into this chocolate. Must try The co-operative makes a 45 per cent milk chocolate and a 70 per cent dark chocolate. daintreeestates.com. Founded in 1915, the family company processes raw cacao beans for its entire chocolate range in Adelaide, South Australia. Must try The dark 70 per cent bar and dark single-origin Peru. haighschocolates.com. Husband-and-wife team Michelle and Dean Morgan's chocolate factory at Emu Heights has a cafe attached. Must try The multi-award winning Alto Beni, 68 per cent fine dark chocolate. (The Tranquilidad featured in a mystery box challenge on MasterChef.) zokoko.com. Names to look for include Dandelion Small Batch Chocolate in San Francisco (dandelionchocolate.com); Mast Brothers Chocolate in Brooklyn, New York (mastbrothers.com); Woodblock Chocolate in Portland, Oregon (woodblockchocolate.com); Amano Artisan Chocolate (amanochocolate.com); and Madre Chocolate in Hawaii (madrechocolate.com), whose Rosita de cacao Xoconusco 70 per cent was included in the Saveur 100 list in 2011. The most renowned bean-to-bar chocolate maker in Britain is Willie Harcourt-Cooze, who works out of a small factory in Devon. He first laid eyes on the cacao hacienda El Tesoro in Venezuela in 1993. The story of his return to Britain to set up a chocolate-making factory was told more than a decade later in the documentary Willie's Wonky Chocolate Factory. But Duffy's chocolate bars, the creation of former racing-car maker Duffy Sheardown's Red Star Chocolate, is fast catching up to Willie. Some of the venerable chocolate brands, which include Valrhona, Michel Cluizel and Bonnat Chocolatier in France, have been treading the bean-to-bar path since 1884. Bonnat is the oldest artisan producer of chocolate in the world; Valrhona has been favoured by chefs since 1922. But, as elsewhere, more small companies, such as Amedei in Italy, are opening.